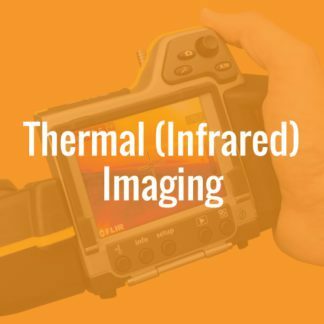 Thermal imaging, also known as Infrared imaging, is an advanced, non-destructive technology that allows Inspectors to discover and show you defects that may not be readily visible or detectable with the naked eye. It is used in conjunction with moisture meters and other specialty inspection tools to have a more in-depth inspection experience. There are many inspectors that use entry level infrared cameras.We use a high-end FLIR B300 Professional Thermal Imager with Meterlink Technology. The B300 delivers 320 x 240 IR resolution. That’s 76,800 pixels. This, combined with FLIRs exclusive Advanced Signal Processing, reduces image noise and produces razor-sharp thermal images four times the resolution of competing brands with 160 x 120 resolution. More data points mean more information is provided for accurate thermal interpretation. More pixels also mean greater visual resolution in the thermal image. In conjunction with our thermal imager, we use an Extech Pin/Pinless Moisture Psychrometer (Moisture meter) w/ IR Thermometer that communicates with our camera wirelessly and documents moisture and other variables in the inspection environment.